This winter has been very very long albeit not very cold. But I am ready for the sun and the beach. And I can finally see the end of it – so as we welcome Spring, I feel like this is the last chance to share a winter cake still. Even though we live in a warm climate with plenty of sunshine and beaches, my other half still enjoys winter sports and we are lucky to have a ski resort not too far away from Gibraltar. 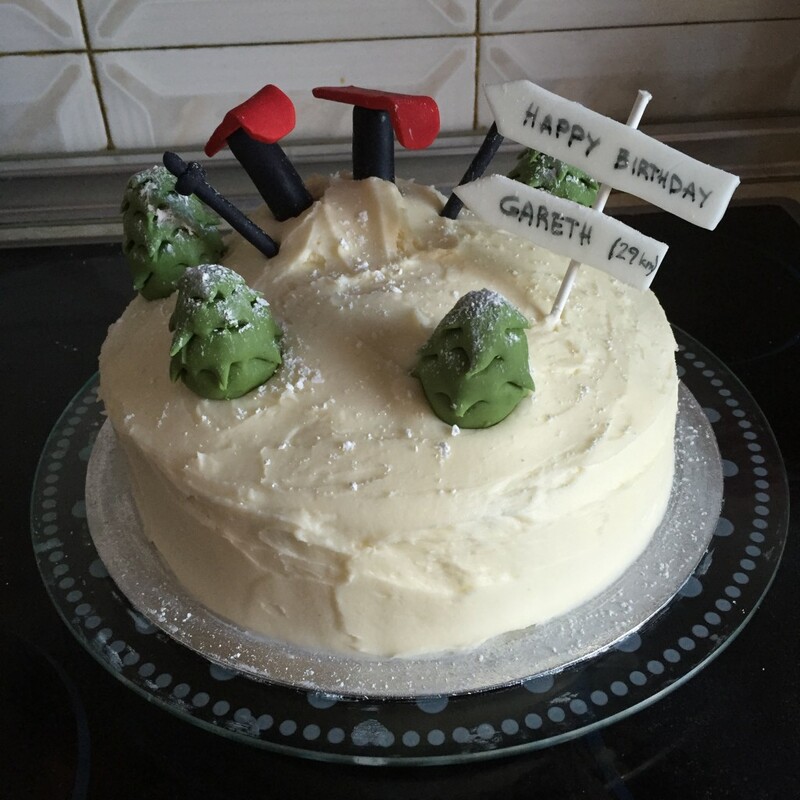 So when he said he wanted to go skiing for his birthday in January, it was obvious what cake I should make for him. Living together did prove to be a challenge for a surprise cake but where there is will, there is a way – special thanks to my friend Tracy for allowing me to invade her kitchen so I can bake the cake in secret still! 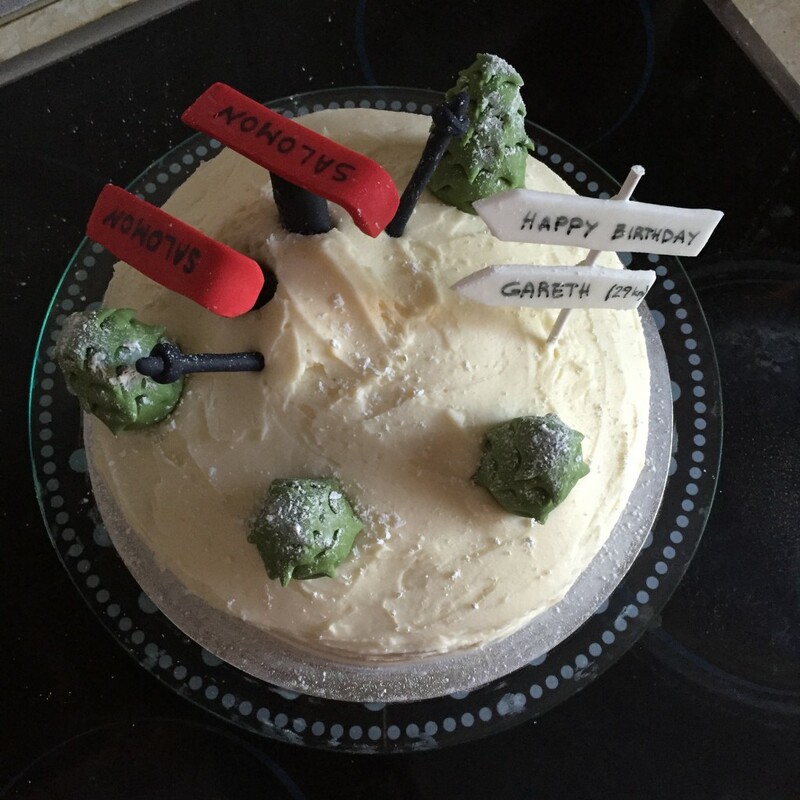 So the unsuspecting birthday boy got not only the iPhone 6 he’d been dreaming of for a while, but a ski chocolate cake with cream cheese frosting too! I was lucky he saw the humor in it and wasn’t at all offended by being pictured as just feet sticking out of a pile of snow*! *When we went to Germany for Christmas, I brought back almost half a suitcase of cake decorating stuff – sprinkles, cookie cutters etc, but my best buy by far was a set of edible felt tip pens (8 different colors too). How did I live without them before? I definitely recommend them to everyone – they’re great for writing on fondant or dry royal icing.